OK I know it’s making you itchy just thinking about it! We spoke to home daycare provider Kathleen Baggio (and mother of two) about some tips on how to identify, prevent and stop lice in their nasty tracks. Start by grabbing 2 pencils and have a good look in these two places. Using the Pencils to separate the hair you are looking for nits, small grey/brownish (some describe them as transparent) they appear to be glued to the child’s hair, close to the scalp. If you find these – YOU HAVE LICE. Now that you have them – here’s how you get rid of them! If you have caught it early you should be able to control it relatively easily, just kidding it will be a ton of work (sorry). Go to the pharmacy and grab the treatment – might as well grab two as you WILL need this as your follow up. Also, make sure to buy the furniture spray while you are at it. 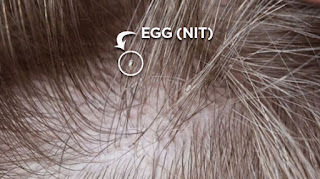 Lice will NOT go away without treatment. Use the Licefreee Spray as prescribed (read instructions carefully) and once the treatment is done immediately and I do mean immediately, remove every single nit you can see – Section off longer hair and go through section by section. This will take HOURS so find a comfortable spot with your child and get to work. Great time to pop them in front of the television for a movie. Wash all outer wear as well, scarves, hats, hoods etc. Over the next 2 weeks monitor daily, and redo the treatment portion at that time EVEN if you don’t see nits – a live one can still be lurking about in school on another child whose parents haven’t done their due diligence as well has you have. It has been said that Lice nowadays should be called Super Lice because their are immune to certain treatments, so extra care should be made to prevent the spread. 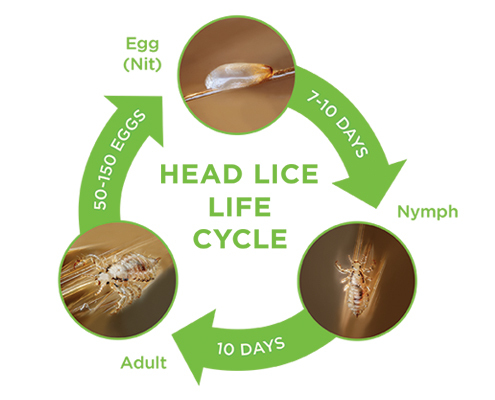 Here is the life cycle of Lice. This is why it is so important to do the follow up treatment in case you miss a nit – it will hatch and all your efforts will be lost. If you do not do these things you, WILL have to start this nightmare all over again, so best to do it correctly the 1st time. Extreme cases may need the assistance of a Lice Squad, they come in and treat the family and help clean house (so to speak). The fee is upwards of $300 last time I checked. Well worth it. I know this sounds daunting, I get it. Been there done that. Here is to happy Lice Free Heads. Kathleen is an Entrepreneur who has worn many hats that including owner a home daycare for many years, co-creating a hit TV Show for Slice TV, Real Estate Investor and hands on flipper, past Huffington Post Blogger and Business Owner. Some of her recent adventures include starting her own YouTube home fitness channel and writing a book. Kathleen is a mom to 2 grown children.